As with the bride’s speech, because wedding convention makes no provision for a speech by the bridesmaid, there’s very little etiquette to follow. Everybody that needs to be thanked will almost certainly have been thanked, so unless the bride has specifically asked you to thank or mention someone on her behalf, you can dedicate your moment in the spotlight to your friend on her special day. I will help you find the perfect words to do you and your friend proud. Like the best man, you are in a supporting role. Your speech is made from the privileged position of being the bride’s best friend. Use this knowledge to help the audience know (and love) the bride all the more. Consort with the best man! It’s important that your speech and the best man’s speech complement each other. Talk with him; make sure he doesn’t see your speech as competition. See how you can pool ideas and maybe even work together. 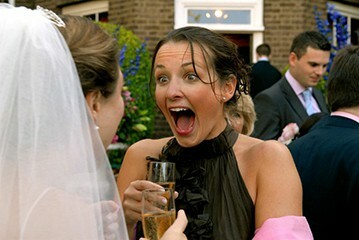 Even if you want to keep your speech a surprise to the bride, you should ensure that the other speakers are aware that you will be saying a few words, and agree at what point you will speak, and what toast, if any, you will make. Begin working on the speech as soon as you can. The more you prepare and rehearse, the more confident you will feel and the better you will be able to convey the desired message and emotion. Rather than simply saying the bride has certain abilities or character traits, tell a story that illustrates them. The only expectation that the audience will have for your speech will be that you talk about how your friend met and fell in love with her new husband. You may have a unique insider’s perspective on how the bride felt after the first date, for example. Everyone in the room will appreciate you paying tribute to the groom and how happy he has made your friend. This is the story that everyone has gathered to celebrate. Book your free telephone consultation on your bridesmaid’s speech via the contact form, get in touch via email or just give us a call. Together we will assess your needs and make a plan.